Sometimes a city takes your breath away and you stare in awe at the life, culture, and colors surrounding you. 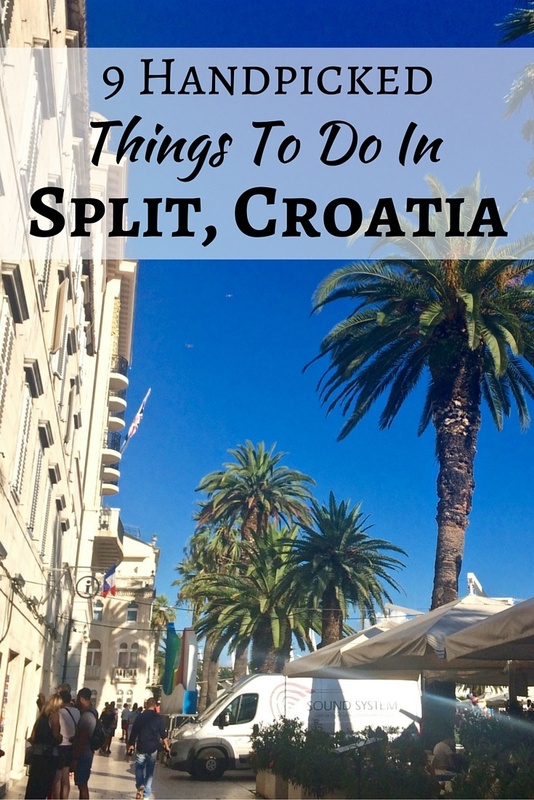 The small towns and villages are usually the ones that get me… but Split was different. As the second largest city in Croatia right behind Zagreb, the city is a popular transport hub if you are traveling around Croatia. 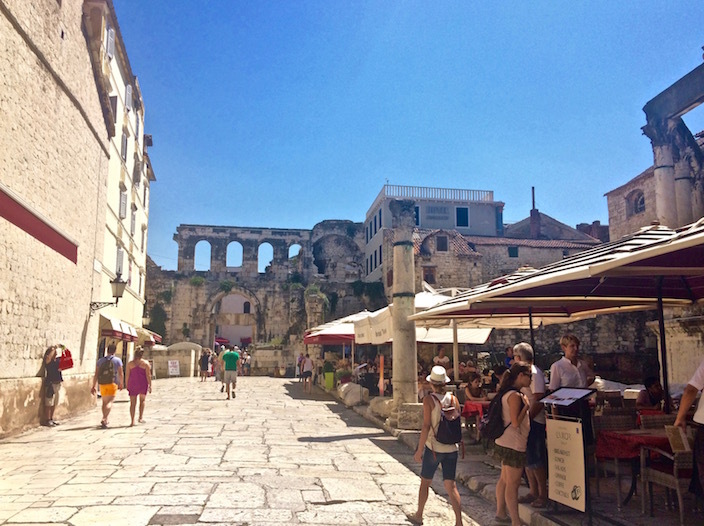 If you are passing through, it’s worth spending any time you have to visit Split to explore it’s history and beauty. 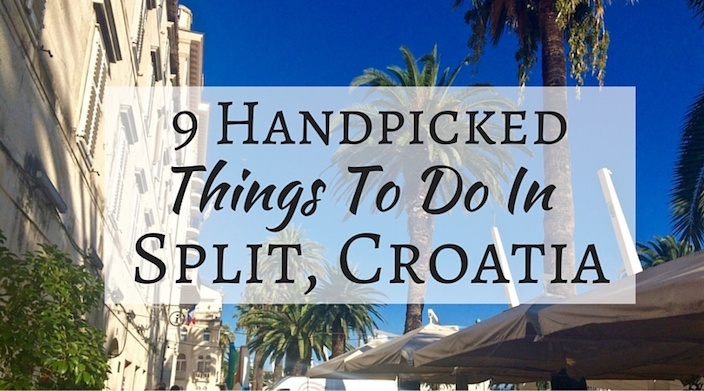 There are more than a few things to do in Split, Croatia, so I’ve handpicked some of my favorites to get you started! Check out the Split Lonely Planet guidebook to take with you, and use the code LITTLETHINGS10 for 10% off! 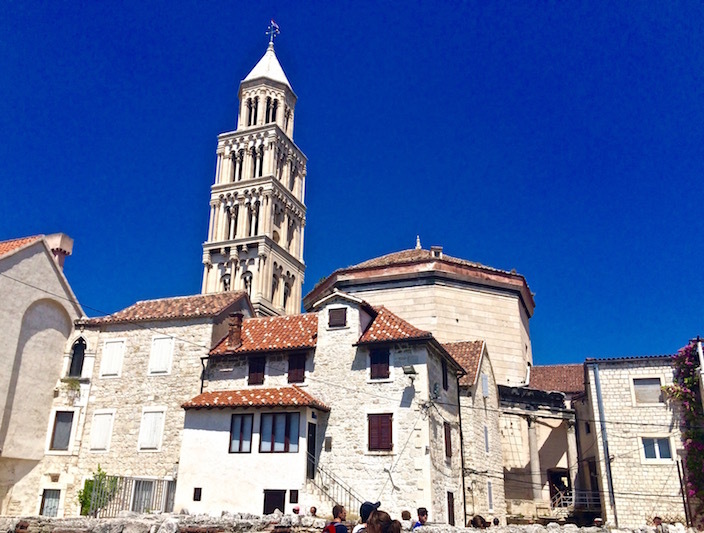 It’s nearly impossible to miss Diocletian’s Palace if you are visiting Split. You may even already recognize it as one of the filming locations for Game of Thrones. 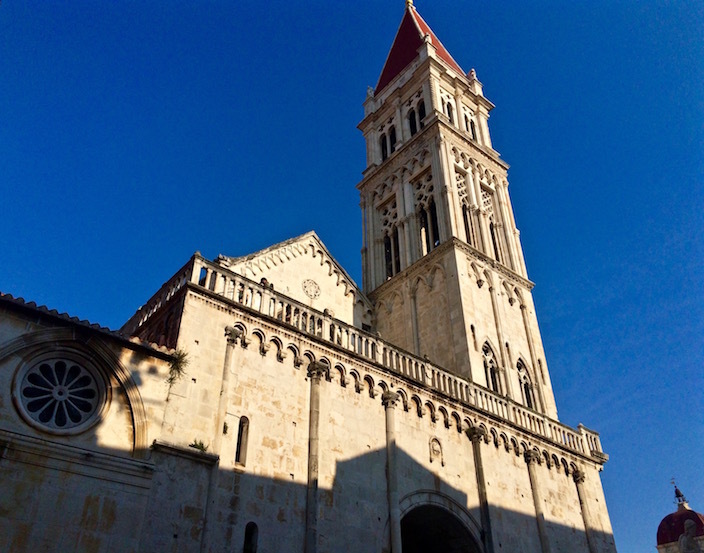 It’s located right in the city center, now known as the old town of Split, and is a UNESCO World Heritage Site. This isn’t just a large building — it’s an entire 30,400 square meters (99,737 square feet) full of shops, restaurants, cafes, museums, bars, courtyards, apartments, and more. Today, there are about 3,000 people residing in this portion of town. Dating back to the 4th century AD, the palace was built by the Roman emperor Diocletian as a place for him to reside after his retirement in May 305 AD after being in power for 21 years. The other half of the palace that wasn’t for his own personal use served the purpose of housing the military garrison. Reveling in peaceful retirement was actually a big accomplishment as he was the first to retire voluntarily and was one of the few emperors of this era to die naturally. Lookout for the crowds if you are around during noon. They do a short 10-minute show and everyone gathers around to watch. I highly recommend doing a tour otherwise you will have no idea what you’re looking at when walking around. 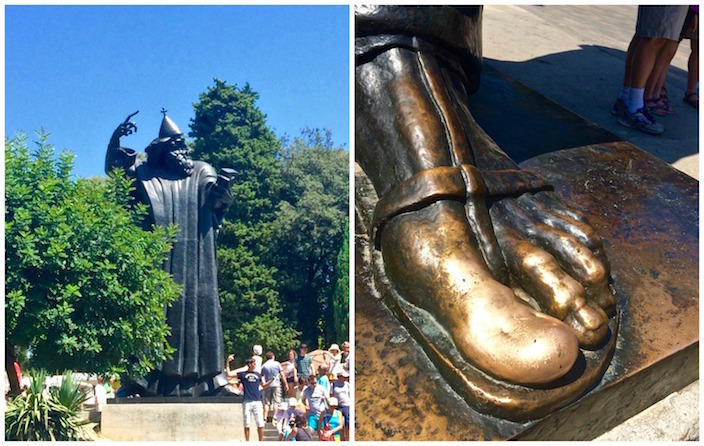 I suggest going with Split Walking Tour, a top tour and activity in Split rated 5 stars on TripAdvisor. 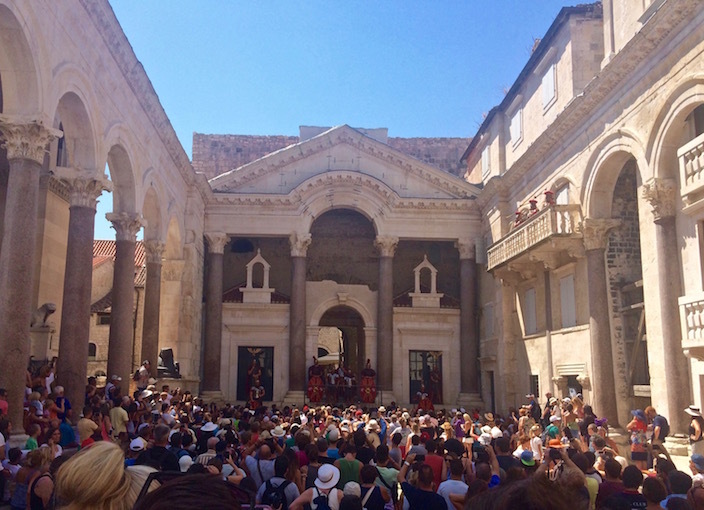 I went on the Diocletian Palace Tour, that takes you through 1700 years of the palace’s history for only 100 kn or 14 € per person. They offer a variety of tour times in English, and even some in French, Italian, German, and Spanish. We were all hungry, had been walking most of the day, and it was HOT outside as you can clearly see from my shiny forehead in the photo below. Yet, our fabulous guide Lucy made every one of those 75 minutes of the tour worthwhile as she shared story after story about St. Duje’s Cathedral, the street where murder of the last Roman emperor took place, the city clock, and more. 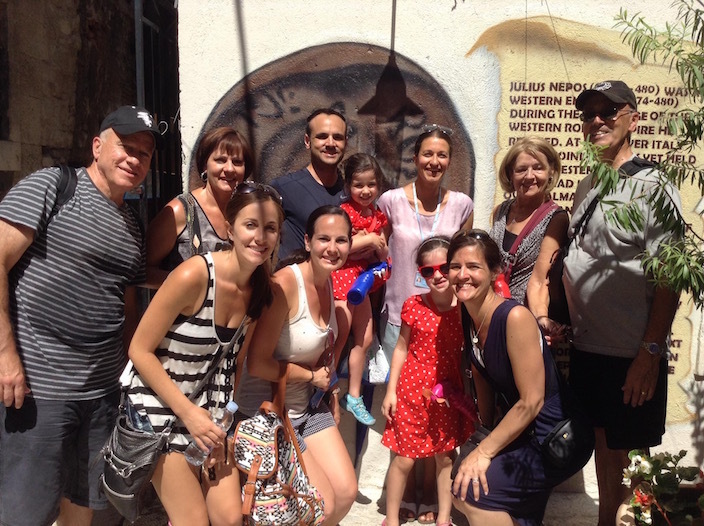 The group of us with our tour guide Lucy after doing the Split Walking Tour of Diocletian’s Palace. 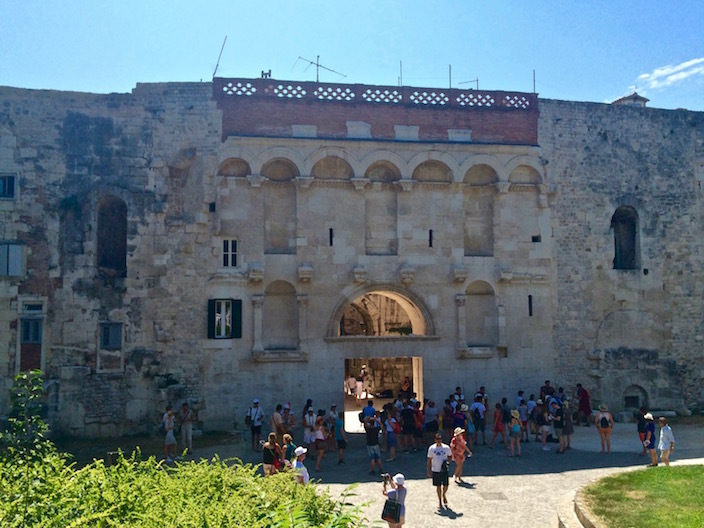 You can easily spot the north entrance of Diocletian’s Palace by the statue of Grgur Ninski in front, the arch bishop of Split in the 10th century, that was created by Ivan Mestrovic in 1929. Make sure to rub his big toe for good luck! This ancient palace stays alive day and night, the bright light illuminating the cobbled streets and music filling the crisp air as couples, families, and solo adventurers stroll the narrow passageways and stop to drink and dine in the lively plazas. Ria Harbor, known as the Riva, sits right along the coast of the Adriatic Sea and is a place to relax, stop at a cafe, people watch, or grab a bite to eat. Palm trees line the walkway where you can enjoy beautiful views and watch the boats coming in and out of the harbor. Day or night, there is always something going on along the Riva! I love exploring a new city, but after a while I start craving some green landscapes. Luckily, in Split they have the perfect option to get away from the bustle of city life. Marjan is a hill on the peninsula that makes up the westernmost point of Split, and is a popular recreation area for tourists and locals alike. 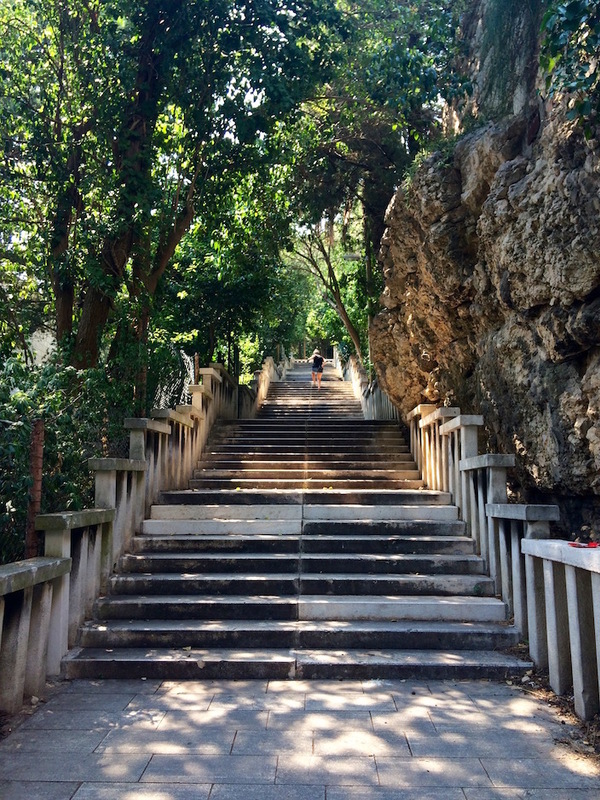 It is covered in a dense pine forest with agave plants and is home to 12 historical monuments, running and biking trails, beaches, rock climbing, and even Renaissance hermitage caves. The highest peak, called Telegrin, is 178 meters (584 feet) high with 314 steps and is worth the climb for Panoramic views of Split, the coast, and even some of the nearby islands if it’s a clear day. Take a break at Café Vidilica when you reach the top for a refreshing drink while enjoying the scenery from above. If you keep heading up the hill from Telegrin, you’ll reach the thirteenth-century St. Nicholas Chapel (Sveti Nikola). St. Nicholas was the the patron saint of sailors, fishermen, and travelers. 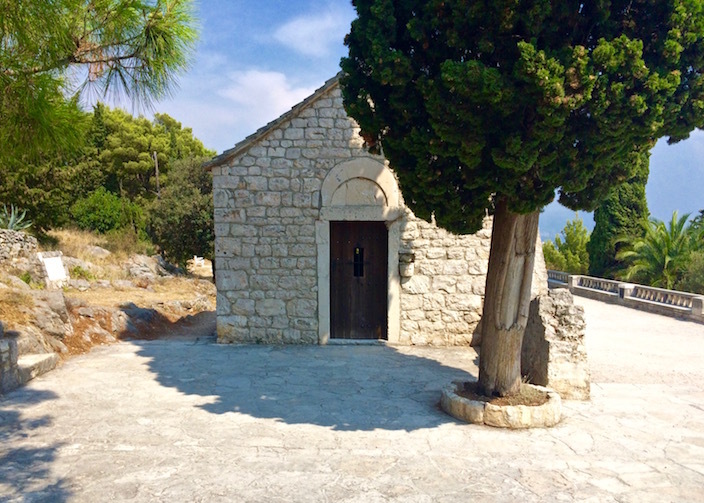 You can find even more chapels if you continue on, and can make a nice day hike out of it with stops at the few beaches along the way if you need to cool off. Exploring the food scene in a new country is one of my favorite ways to get to know a different culture. 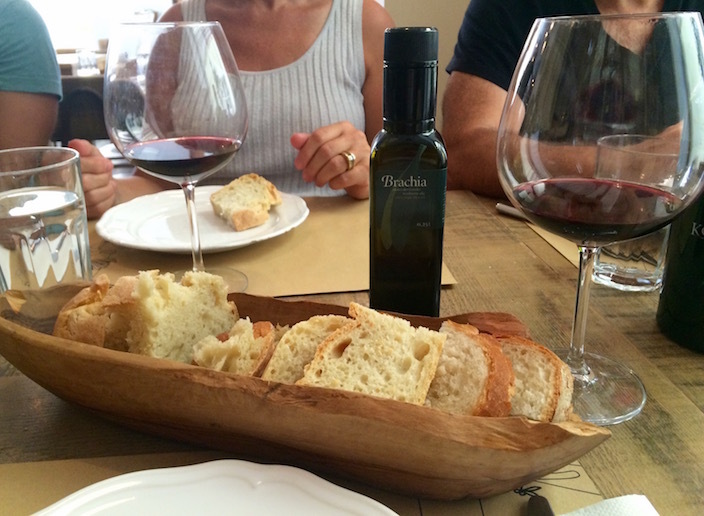 I discovered a lot about Croatian culinary traditions by taking a Croatian cooking class. An easy drive or bus ride, Trogir is only 27 km (about 17 miles) west of Split. 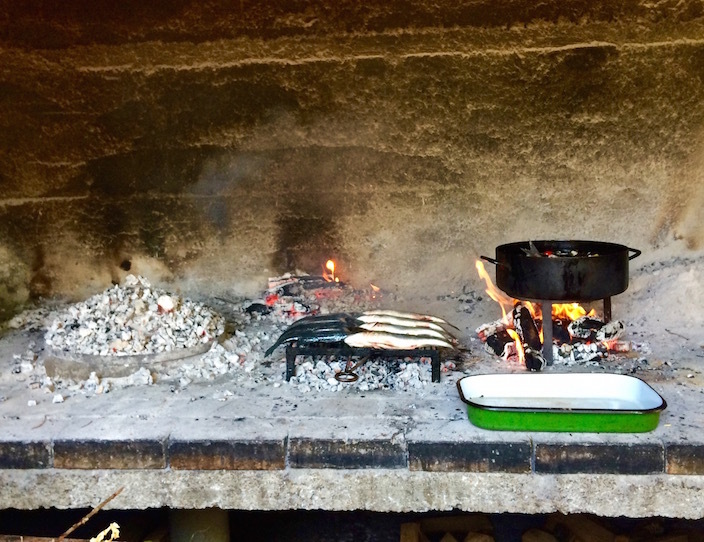 Learn about the traditional dishes in the Dalmatian region, their history, and how to make them. Then of course, you get to eat your delicious cooking afterward! There is a gelato shop on nearly every corner. Any one will do, but make sure you have your fair share of gelato! 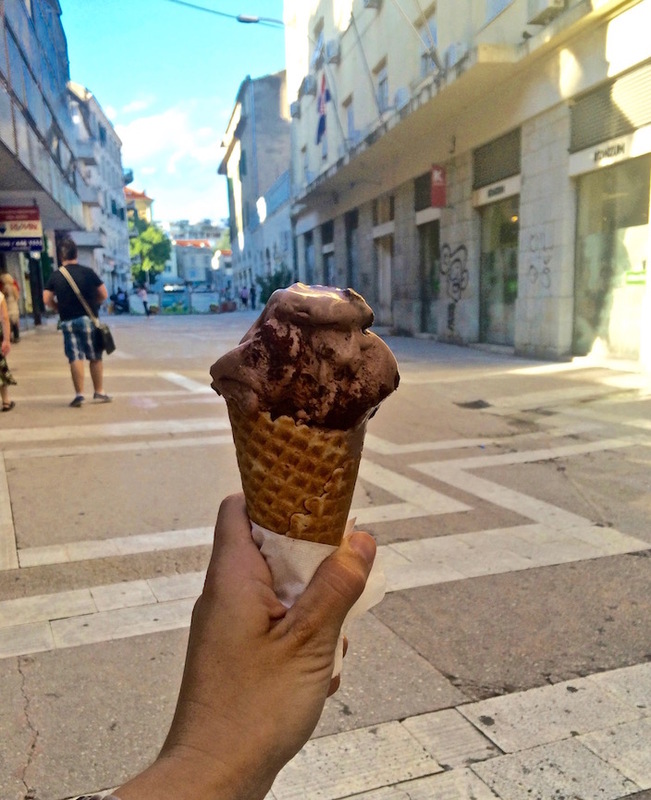 Especially if you are traveling in the Croatian summer heat, plenty of water and gelato will keep you nice and cool. Who’s craving some gelato now? Only about 40 minutes from Split you will find the charming historical town of Trogir, the perfect day trip destination. Designated a UNESCO World Heritage Site in 1997, Trogir is the best-preserved Romanesque-Gothic complex in all of Central Europe. The towering medieval walls of the city house over 2,000 years of history. Get lost walking the winding, narrow pathways, try a few of the quaint restaurants, and browse through the shops and local vendors around town. There are multiple busses running every day between Split and Trogir. Buy your tickets online, or on foot at the main bus station. Although the weather didn’t work in our favor this time around, there are also many island day trips like to the Blue Cave and the Island of Hvar. I have a slight obsession with olive oil, so when I discovered Uje Oil Bar I knew I wasn’t leaving Split without stopping there first. 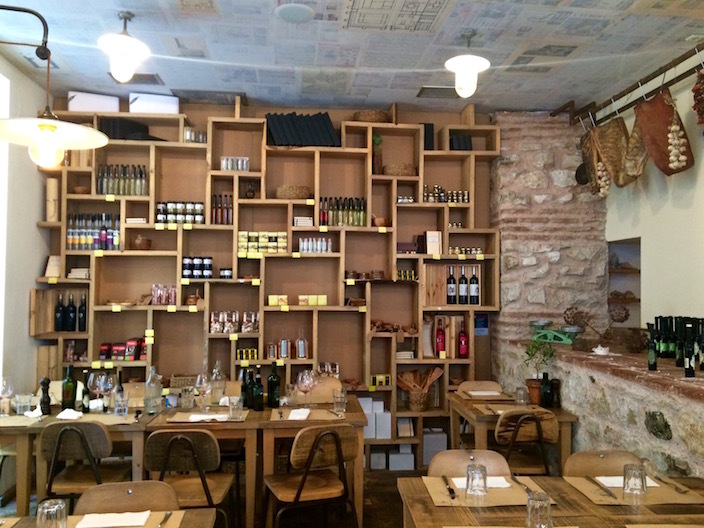 Tucked away on one of the small side streets in Diocletian’s Palace, Uje Oil Bar offers tastings of the 50+ varieties of Croatian olive oils that they have available, served with freshly baked bread. The flavored oil with chile was one of my favorites! They also have a short menu that is written each day, based on what’s in season. Since they have limited seating, I would advise making a reservation ahead of time. They also have a small shop section that you can browse through if you want to take any of their oils, Croatian wines, jams, or other products home with you. This is a where not to eat in Split, although it has nothing to do with the food because we left before we could even order a drink. Ironically, the restaurant named NoStress was actually very stressful. 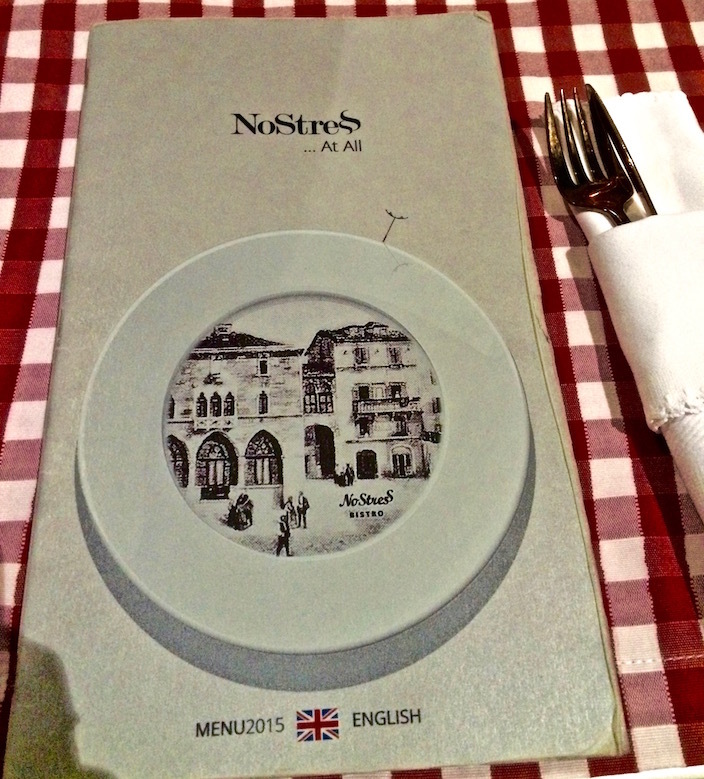 NoStress – The most stressful restaurant I have ever been to. We were a group of seven, so before ordering we always asked at any restaurant to split the check three ways. No one ever had a problem with that – until now. “No, we don’t do separate checks here,” our waiter told us. Okay, we’ll survive right? Well, this restaurant apparently didn’t have anything, according to our waiter. Olives for a martini? They don’t have those. A glass of water? Nope, they don’t have water. His entire demeanor was rude and we had enough. We got up and went to another restaurant that was much less stressful. It seems like we were not the only ones who received this terrible service, although at least we left before actually having to pay for anything. As an alternative, I recommend making a reservation at Trattoria Tinel and enjoying a delicious, relaxing meal instead. There are plenty of affordable apartment rental options near the city center. I found that Split has the best options on booking.com. The main bus station is very centrally located, making it even easier when you’re coming in from out of town. 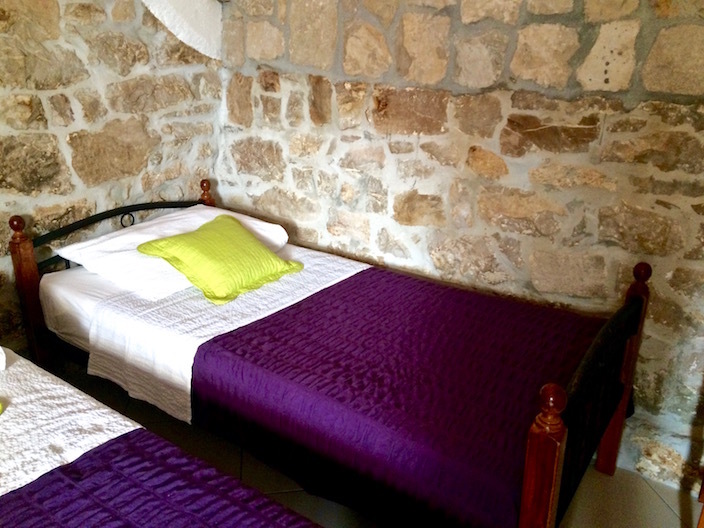 We stayed at the adorable Villa Spaladium, in the Studio Deluxe with Sofa Bed room at Radunica Street 17. The owners were very friendly and provided a map where they showed us their favorite restaurants and attractions around town. 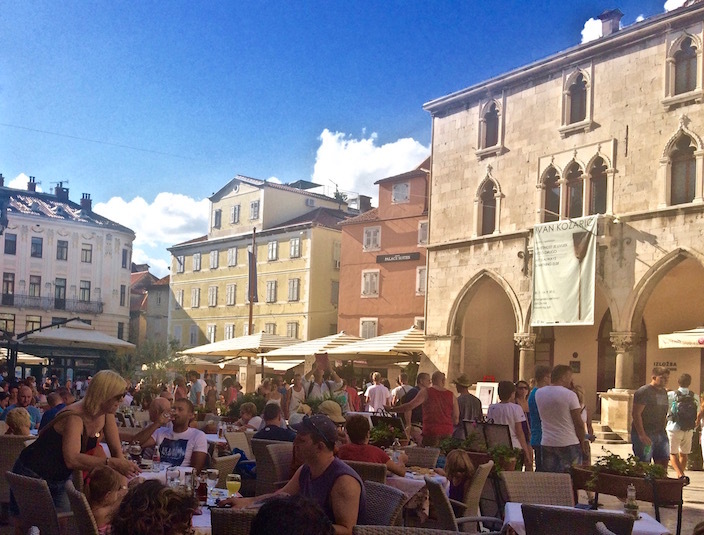 The adorable terrace is the perfect spot to get lost in a book or simply enjoy the Croatian weather. The studio where we stayed was in a great location, only a five minute walk from Diocletian’s Palace. I’ve also found that since my visit, more accommodation options in Split are popping up on Airbnb, so be sure to check there as well. If you use that link, new users will receive $40 off your first stay! I hope you find that Split takes your breath away too, and that you have a chance to spend some time in the city instead of just passing through. As one of the oldest Croatian cities, the history and people have left a lasting impression that I hope to experience again someday. Remember to snag your Split Lonely Planet guidebook to take with you (and use the code LITTLETHINGS10 for 10% off)! Have you visited Split? 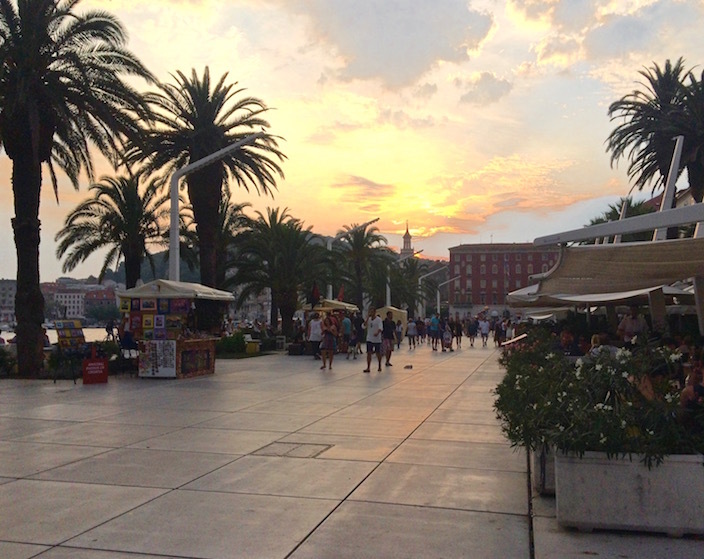 What are your favorite things to do in Split, Croatia? Let me know in the comments below! If you’re looking for something scary to do, at least if you’re not the best with climbing ricketty stairs next to long possible drops, head to the top of the bell tower. There’s a beautiful view from the top, but it’s a pretty terrifying journey, with the metals stairs looking almost as ancient as the actual tower. 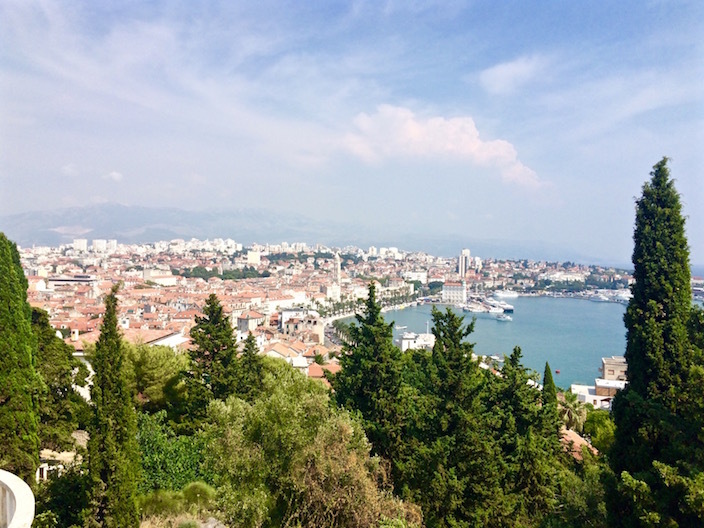 I’m hoping to visit Split this year, already found some cheap flights and just trying to fit it in my schedule, so this post is a really great help! It seems like there’s plenty to see and do and it’s impossible to be bored in Split! I’m definitely going to use your tips when I eventually go there! So glad to hear you found this useful Kami! You will definitely keep busy 🙂 Hope you enjoy your time in Split! In addition to Trogir, another place worth exploring is Omis (down the coast in the opposite direction). Pretty town with some incredible geography, known as the place for adventure sports in the area. I did hear good things about Omis! Sadly I didn’t have the time to squeeze it in on this trip, but I will definitely make sure to visit next time! Thanks for the suggestion! going to Croatia in early part of June 2017 🙂 So excited.. just in process of booking flights from Calgary soon. All this information is great! Thank you! Awesome glad you found it useful! Hope you have an incredible trip! Isn’t Croatia a dream? 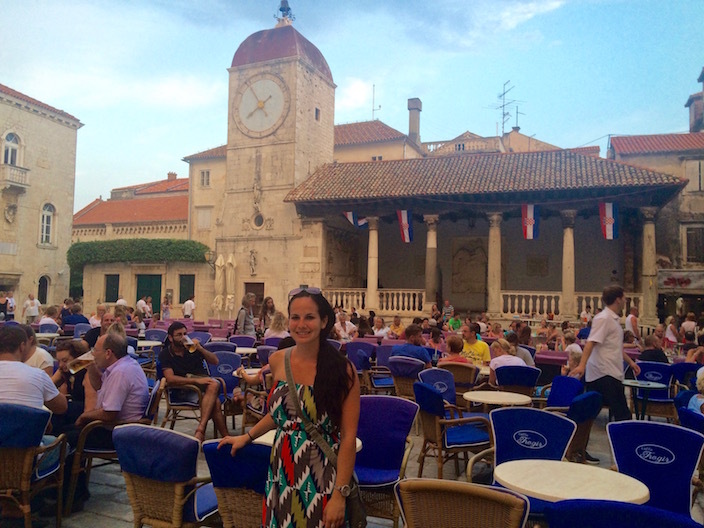 I’ve only been to Dubrovnik, Hvar and Rovinj but I loved everything about it! Adding Split to the list. It really is! Hvar and Rovinj are on my list. I’d love to go back and explore more of the Istria region! Wow! I love the look of the old architecture, Marissa! How long does the walking tour take? Yes it is truly impressive! The walking tour lasts about an hour and 15 minutes. 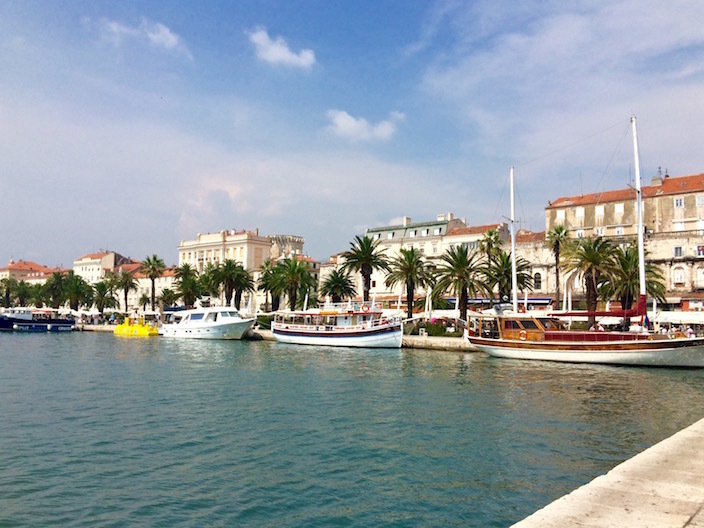 Wonderful ideas to spend your time in Split – you also have lovely pictures!